Description: The Bushymouth catfish grows up to 15 cm long and can live over 10 years. The animals are black to olive brown with tan spots and dots. The dorsal and caudal fin have a light hem. All Ancistrus species form fleshy, antler-branched appendages on the head, which are more pronounced in males. The species is easy to follow and often multiplies in the community pool. A clutch contains about 90 eggs. 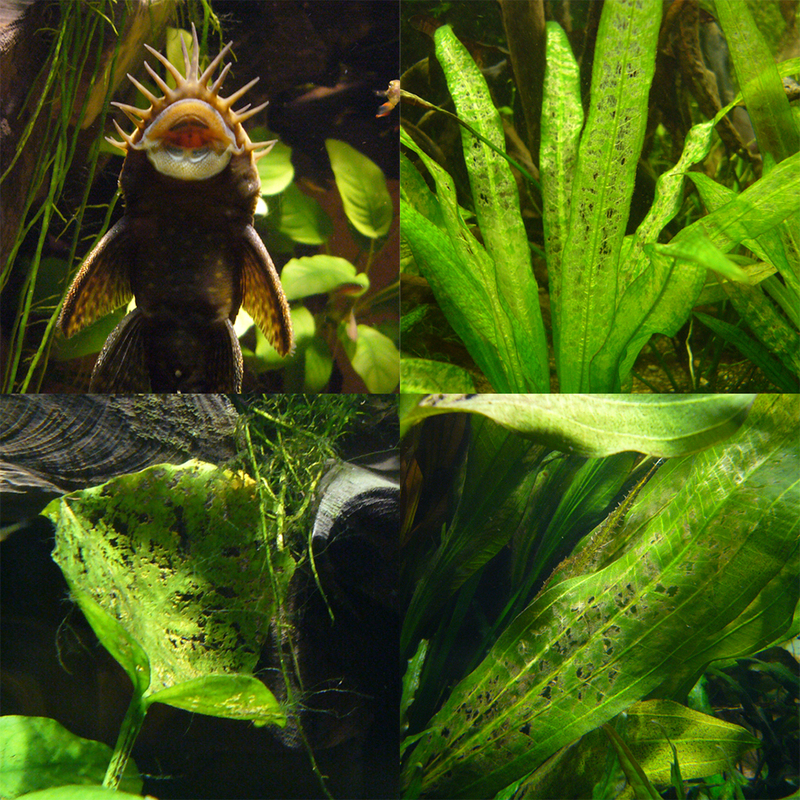 Plant damage: The Bushymouth catfish like to lie on large, broad leaves, such as those of Echinodorus and Anubias . While doing so, they are constantly scraping on their underlay with their raspy mouth. This creates a characteristic scrapbook, where the surface of the leaves is damaged, but the leaf ribs remain as a grid. Assessment: The Catfish has been known since 1911 as an aquarium fish in Germany. The animals are omnivores. They grind stones, wood and plants all day long. They are therefore used for algae control, but eat neither blue algae nor brush algae, for example. Also, the amount of growth in an aquarium is not sufficient to meet the food needs of the animals. Individual animals seek a root or a stone as shelter and let themselves be planted Keep aquariums away from plants by daily feeding with peppers, cucumbers, courgettes and other vegetables. If the feed fails or the animals multiply and the feed or the number of feeding places is insufficient, plant damage is unavoidable.